Akenhead On Fire Once again. Wow what a year for British Pro and Hit Squad Member James Akenhead, first off he is one on the November 9 elite, made the WSOPE final table finishing a respectable 9th and has now made his third final table in sucession by reaching the final of the FULL TILT Poker Million, sending Tom “Durrrr” Dwan and the Magician Antonio Esfandiari to the rail along the way. The final table will be no easy run either though as the ever tough Juha Helppi will be in attendance along with card runner founder Taylor Caby, Dag Martin Mikkelsen and the colorful figure that is Luke “_FullFlush1_” Schwarz all in attendance, with Schwarz holding the chip lead going into the final it will make for some interesting action. 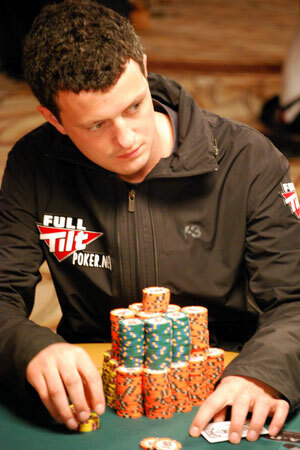 “I’ve watched previous Poker Million’s on television, so to get to the final table in my first appearance is something I’m proud of,It’s the biggest tournament of this structure I’ve ever played in.” commented Akenhead. 6 out of the final 7 have been named but 1 space is still up for grabs and this will be filled by a FULL TILT online qualifier. James goes into the November 9 showdown in Vegas as the short stack with just over 6.8 million in chips and is a 16-1 shot with betting exchanges but with the run of form he is on at present it will be hard to class him as out of the running. This entry was posted on Wednesday, October 28th, 2009 at 10:45 am and is filed under Poker News. You can follow any responses to this entry through the RSS 2.0 feed. You can leave a response, or trackback from your own site.